Today we are lucky to be joined on the blog by author and illustrator Steven Lenton who has written a guest post for us to celebrate the publication of his new picture book Let's Find Fred. With its brilliantly captured detail, bold colours and humorous cameos, this book is a pleasure for children and adult alike and the girls have been enjoying it on bedtime-story repeat for the last couple of weeks - not least due to the movable panda eyes on the front cover. 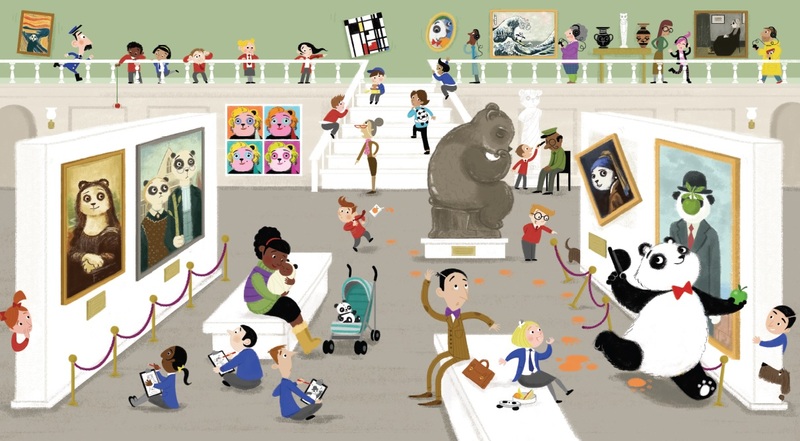 For any art-lover, the book is worth buying simply for the double page spread where naughty Fred, chased by his exhausted zoo-keeper, escapes through a gallery filled with cleverly panda-ized art and artefacts... from Egyptian panda deities and Warholed versions to Mona-Bear and the Bear with a Pearl Earring. If you look closely through the story, you can also spot the Beatles and other cultural cameos. 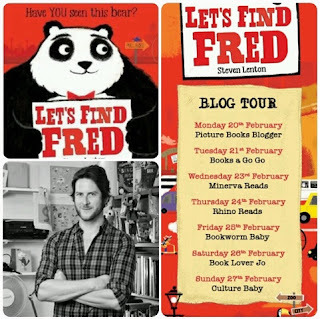 For his guest blog post, we asked Steven to tell us about where the inspiration came from for his book, and how the creative process works. 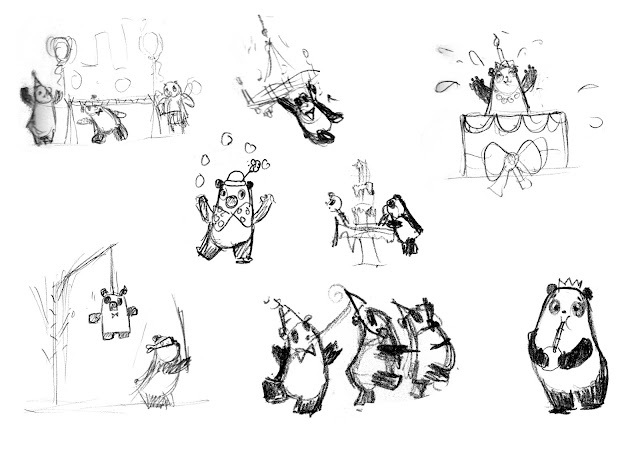 He's also treated us to a glimpse of some of his early sketches and concept designs. I love looking at these images - they are an unparalleled chance to see where picture book illustrations begin, and give us a glimpse of the hand of the creator behind the polished result we only usually get to see. 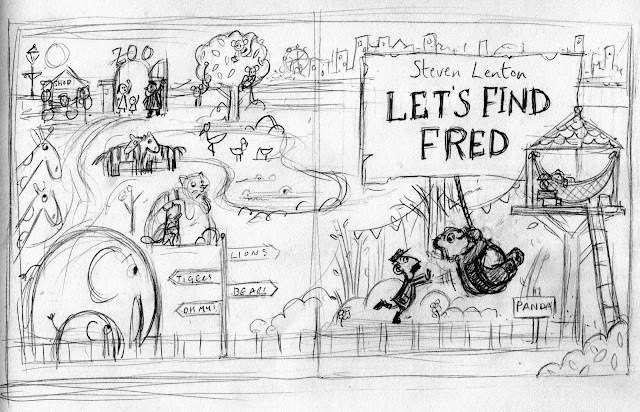 "Let’s Find Fred was created from an original concept by Scholastic and my fun animal character designs that they spotted in both my earlier picture books and greeting card designs. 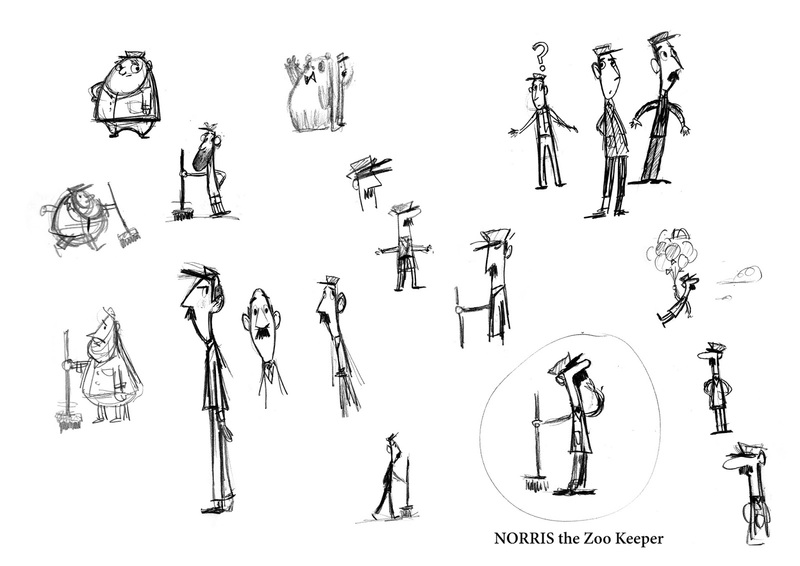 Over the years I have loved visiting zoos and have drawn lots and lots of animals in both my sketchbooks and final artwork for picture books. I love drawing and designing animals so when Scholastic approached me with this project I leapt at it like Fred at a Candy Floss factory! Creating the aesthetic for Fred was a very collaborative process and I really enjoyed designing a new Panda character. I always start my books with lots of pencil sketches of the main character, then any subsidiary characters, in this case Stanley the Zoo keeper and the other animals. The large, round fluffiness of Fred works nicely with Stanley who is very angular and sharp – inspired by the Mr Man, Mr Rush – his triangular nose always pointing in the way of the chase! 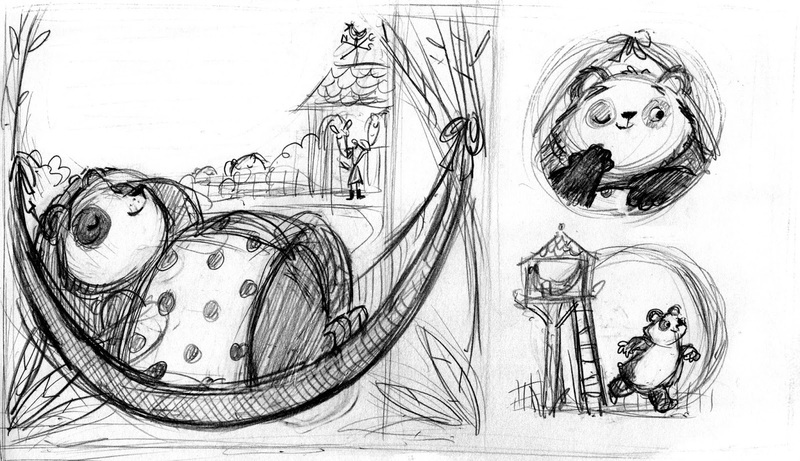 Once I have designed the characters in my sketchbook in black and white (VERY handy for a Panda!) I then move on to colour – in this case I thought it would be great to give Fred a red accessory and a tie seemed to be the perfect fit for Fred – I tried a regular tie but it made him look too much like a business panda and was a bit too serious, so a bow tie it was! 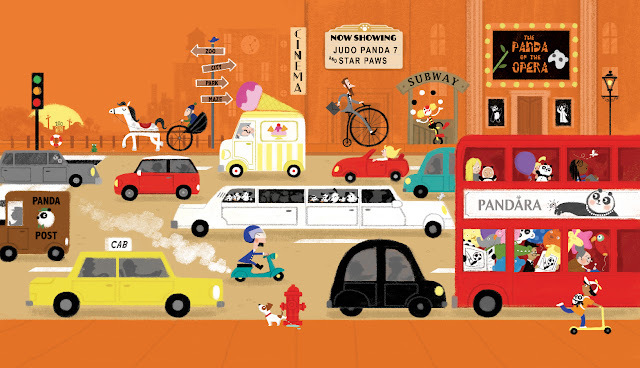 The Scholastic team and I wanted to create a fresh, bold look for Fred and I researched lots of ‘Spot the…’ genre of books to get an idea of the kind of styles that work well with this kind of book. I decided on a colourful, minimal-lined style, not dissimilar to my usual work but with a simpler, less chalky edge. This was mainly because, as there a lot of small details and characters among the varied city scenes, bold silhouettes, clear to read expressions and acting were essential. The background elements such as vehicles, signage and foliage were fairly simple to design once the characters had been set – bold, simple lines and colours with a varied palette on each spread to enhance the atmosphere and theme of each scene. The final look and feel is hopefully a nice combination of contemporary design and a warm, cuddly, fun collection of characters, vehicles, environments and narrative. I hope everyone enjoys the book – it really was such fun to create!" I love the sort of story book adventure that re-imagines famous art through the eyes of other creatures. It gets you to really look at why certain works are so recognisable, even when adapted, and it is always a joy to see how the unique styles of artists have been so effectively captured as part of other worlds. Two others I'd recommend are ones I collected a while ago and they are both great introductions to art as well as lovely stories. 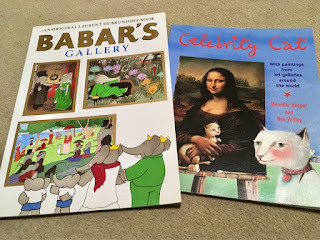 The first is part of the well-known suite of original Babar books. Here the royal family of elephants turn to philanthropy and create a museum to house all the work they have collected over the years - modelled on a combination of the Musee D'Orsay and the Met in New York, and containing much of the canon of famous works (plus an artist in residence - Pollock!). The family move through the museum discussing what they like and why - its a great exploration of what museums and art are really for and how they can serve as inspiration for our own creativity. The second is a sweet tale about a group of cats who are unimpressed that little of the art they see contains images of felines. They set out on a journey round the globe to rectify the situation. Of course the Mona Lisa needs a cat to cuddle, Van Gogh's chair is far too empty and there are always cats in homes. Where is Las Meninas' cat? This pair of books are a great addition to any little Culturebaby's bookcase.